People’s State of the Nation protest at NYC Philippines Consulate | Fight Back! 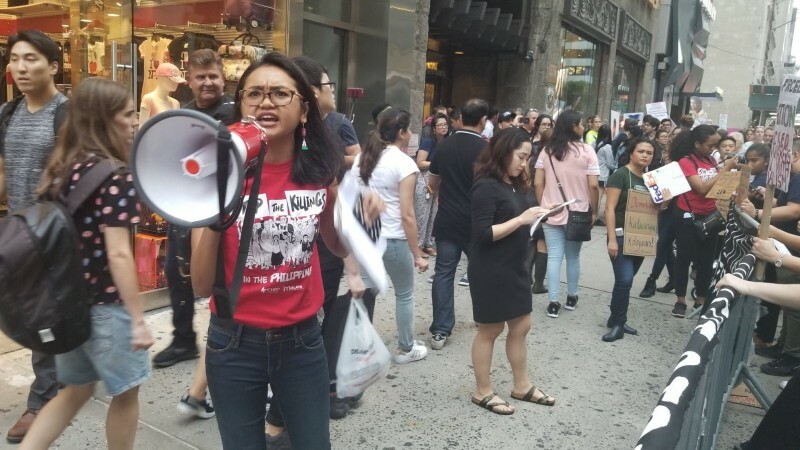 New York, NY - Around 70 people gathered on Monday evening, July 23, outside of the Philippines Consulate General to hear the People’s State of the Nation Address. Earlier that day, Philippines’s President Rodrigo Duterte gave the State of the Nation Address (SONA) in the Philippines. The protesters, organized by the Malaya Movement, challenged Duterte’s lies and pointed out the actual conditions the people were facing. Some spoke to the 20,000-plus extrajudicial killings as a result of Duterte’s Drug Wars. Others brought up how working-class people are forced to go abroad for work, and others spoke about the conditions that the indigenous people are facing under martial law. Many speakers brought up how those fighting for human rights in the Philippines were targeted and thrown into jail. The rally ended with a rousing speech by Chrissi Pagkilos, an organizer of the event, who urged all those attending to bring the movement to streets and to keep organizing.